The problem of counterfeit drugs is a significant issue as administering a counterfeit medicine can have serious health consequences. The counterfeit drug market is a multibillion pound business. The problem compounded by the growing number of medicine suppliers which includes internet vendors. Identification and quantification of the (Active Pharmaceutical ingredients (API’s) is of paramount importance. The formulated medicines in addition to API’s contain considerable amounts of excipients. The API needs to be extracted for identification and quantification. In order to extract all the API the medicine tablet is ground into powder and appropriate solvent is added to it. This results in to a suspension as all of the excipients are not soluble. For efficient extraction the suspension is sonicated for ~30min and then centrifuged to separate the insoluble excipients. The supernatant liquor containing the API is analysed by 1H NMR to confirm the identity. 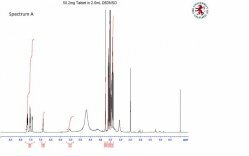 Once the identity is confirmed quantification by 1H NMR is carried out using and internal standard of known purity in duplicates. 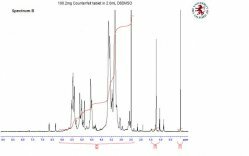 The purity determination is carried out by weight the medicine tablet powder and the standard in the same vial, solvent is added to this, then sonicated and centrifuged prior to analysis, as carried out for identification. The 1H spectra are obtained under quantitative conditions and purity of API is calculated from the NMR data as a weight % and this in turn converted to actual amount in the tablet (mg/tablet). A suspected counterfeit tablet was analysed, spectrum B and compared with a control tablet, spectrum A.